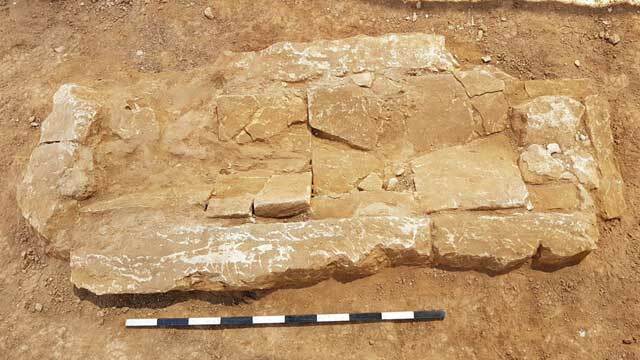 In June 2017, an excavation was conducted within the precincts of the central railroad station of Be’er Sheva‘ (Permit No. A-8014; map ref. 180817-44/572336-72; Fig. 1), prior to the construction of a fifth railway platform. 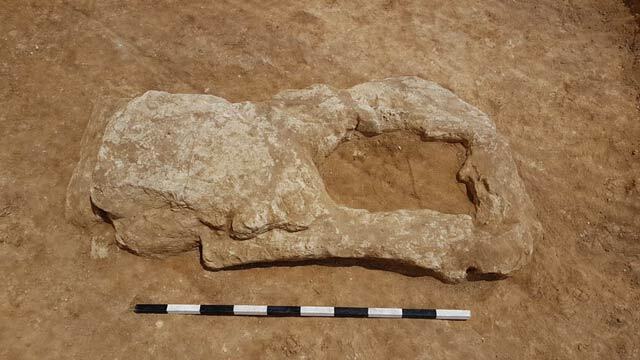 The excavation, undertaken on behalf of the Israel Antiquities Authority and financed by Israel Railways, was directed by A. Rasiuk (field photography), with the assistance of Y. Al-‘Amor (administration), E. Aladjem (surveying), E. Belashov (drafting) and S. Talis. The site is in the Be’er Sheva‘ transportation center, just east of the railway tracks and central station. In April 2017, H. Hamar excavated trial trenches at the site, revealing several cist graves. In 2012, a necropolis consisting of c. 80 graves, dating to the Byzantine period, was excavated north of the current excavation area (Peretz 2014; for the distribution of the Byzantine-period cemeteries in Be’er Sheva‘, see Gil‘ad and Fabian 2008, Abadi-Reiss and Eisenberg-Degen 2013). 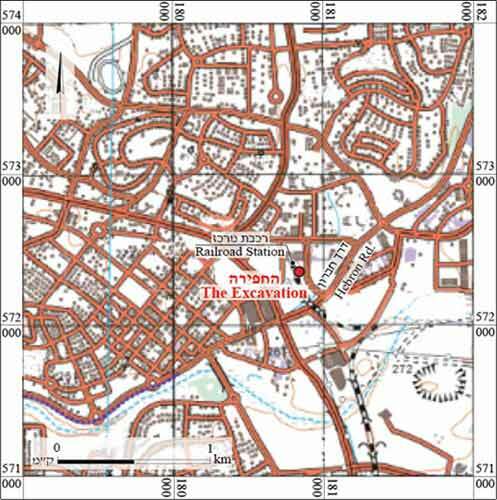 In 2011–2012, settlement remains dating to the Byzantine period, including villas or public buildings, were exposed in an excavation conducted southwest of the excavation area and west of the railroad tracks (Talis 2015). Five cist graves (L101–L105; Table 1) were exposed, but not excavated. They were built of chalk and were aligned along a general northwest–southeast axis (Fig. 2). The graves were in a poor to average state of preservation and some had been damaged by development work. 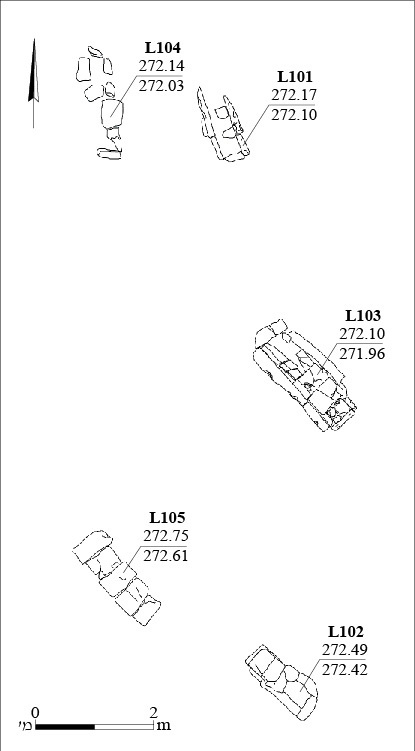 Four of the graves were probably used to bury adults while one smaller grave (L102; external dimensions 0.65 × 1.50 m; Fig. 3) was most likely used to bury a child. The graves were constructed of chalk slabs, some of them well-dressed, set in place on their narrow side. The stones delimiting Grave 103 were straight-dressed on the inside and were roughly hewn on the outside (Fig. 4). Several covering slabs were placed on top of the graves. Three graves were missing some of the covering stones (L101, L102, L104) and two still had all of their covering stones in situ (L103, L105). Fragments of bag-shaped Gaza jars dating to the Byzantine period (fourth–sixth centuries CE; not drawn) were found next to three graves. The graves were covered upon completion of the excavation. The graves are probably another part of the strip of cemeteries that surrounded the city of Be’er Sheva‘ during the Byzantine period. This necropolis extended mostly to the north and northeast of the Byzantine city of which other portions were exposed near the current excavation site. Abadi-Reiss Y. and Eisenberg-Degen D. 2013. Be’er Sheva‘, Balfour Street. HA-ESI 125. Gil‘ad Y. and Fabian P. 2008. 7,000 Years of Settlement: The Archaeological Remains in Be’er Sheva‘ from the Sixth Millennium BCE until the End of the First Millennium CE. In Y. Gradus and E. Meir-Glitzenstein eds. Beer Sheva: Metropolin Be-Hithavut. Jerusalem. Pp. 303–331 (Hebrew). Peretz I. 2014. Be’er Sheva‘ Civic Center. HA-ESI 126. Talis S. 2015. Be’er Sheva. HA-ESI 127. 3. Grave 102, looking northeast. 4. Grave 103, looking northeast.